The Audio-Technica ATH-CKR10 are, as claimed by Audio-Technica, the first dual phase push-pull drivers. Push-pull dual drivers are a common used speaker configuration to achieve reduction in harmonic distortion. This reduction in distortion helps provide a more accurate, pure sound as the drivers are “self-correcting” each other. Prior to writing this review I was unaware of push-pull drivers and their intended effect, and now I agree that ATH-CKR10 do achieve this effect very well. The separation between the left and right channels is outstanding. Realizing this was one of the moments when I realized I have been using subpar equipment for quite some time, being presented with a superior performing piece of hardware. The bass response was strong but not overpowering from the 13mm drivers, and it didn’t sound artificially boosted. Midrange and highs are clear and crisp with no detectable distortion. As I increased volume levels the sound became uncomfortable before any distortion became present. The ATH-CKR10 are certified “Hi-Res Audio” capable. This is a certification that says the product can reproduce audio that is 96kHz/24-bit or better, typically called lossless audio file formats. I didn’t evaluate any lossless files to see if there was any difference in quality. I did use these to listen to analog signals (LPs), MP3s, and streaming audio. With all of them these premium buds performed admirably. The housing for the headphones are a metal-coated titanium. The connector is an L-style with a gold-plated 3.5mm plug. The cable is just shy of four feet long with a soft rubber jacket. The sturdy cable did start to remember the winding I did to fit it in the leatherette case that is provided. 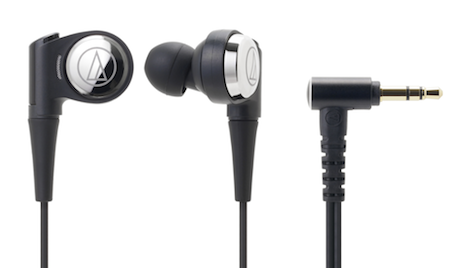 These earphones are packaged with four different size of silicone eartips. This is a welcome range for someone like me who has notoriously wonky ears for in-ear headphones. Once placed in the ear they are remarkably comfortable. I was able to wear them for over two hours. As time went on they simply disappeared, minus the occasional cable noise that cropped up from not very frequently. I almost wrote the wrong review for these headphones. When I received them I was one week away from a half-marathon race I was running. I was experiencing the maximum of training fatigue and these were a welcome distraction. “I can use these during my training runs and get review time!,” I thought to myself. 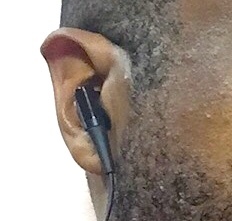 One thing became quite clear: these are not athletic earphones. This is not a disparaging remark. I have several pair of over-ear headphones that I use for different occasions. I use a pair for DJ work that are low cost, average quality headphones but sturdy workhorses. I have another pair of premium headphones for home listening. Audio-Technica ATH-CKR10 SonicPro In-Ear Headphones are a high quality pair of premium in-ear headphones that can used for home use as well for great audio listening on the go, although you may want to grab a different pair for your 12 mile run. MyMac Review Rating is 8 out of 10, with a personal recommendation. Hi – I understand that a near-$400 earphone isn’t the best bet for sweat-soaked running and so on, but other than moisture, what would be the main reason not to use it in workouts?